During my pregnancy, I can not take any sweet , as my taste bud just does not like sweet at all. I was always tire and can not do much baking. At time I can not even look at any dessert picture. It will make me want to puke. 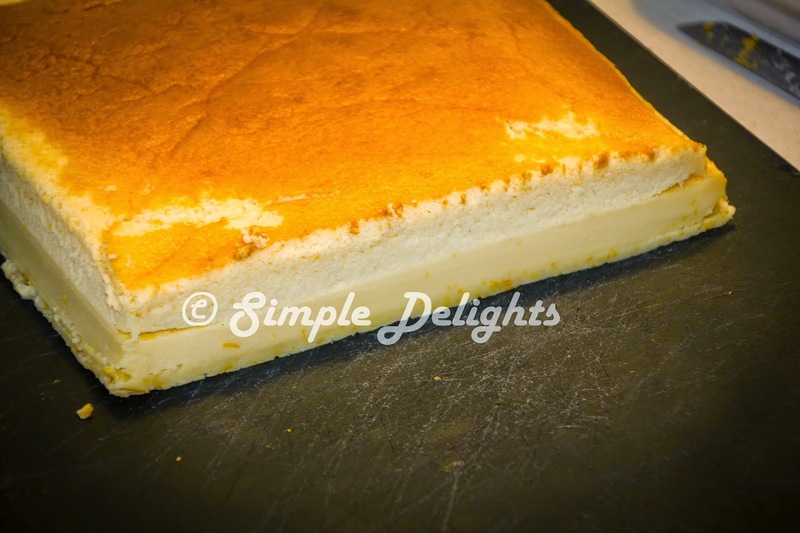 However by chance I come across this recipe -> AncooJournal Magic Custard Cake. What attract me is the 3 different texture in one cake. 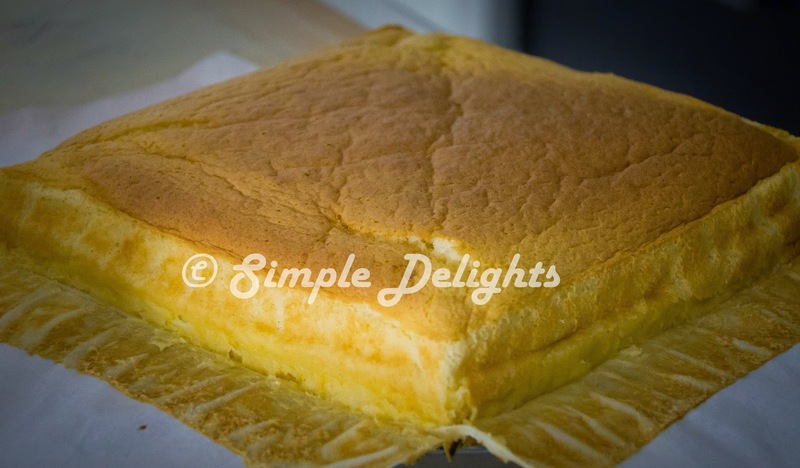 I wonder how it will taste when you have 3 texture - cake, custard and the bottom chewy dough . Interesting part of pregnancy is , once you give birth . Whatever was weird then , will get back to the normal self. When I finally found the time and got my "normal" taste bud back , I can not help but to try on baking this cake. 1. Preheat oven to 160 C fan . Line a 8"x8 " (20cmx20cm) Square cake pan all sides up . I used a removable square pan . 2. Melt the butter and set aside for slight cool. Warm the milk to lukewarm and set aside. 3. Whisk egg yolks with icing sugar using hand held mixer until light and fluffy. Mix in the melted butter and 1 Tbsp of water until evenly incorporated ( about 2 min). 4. Mix in the flour until evenly incorporated. Slowly beat in the lukewarm milk and vanilla extract until everything is well mixed. 5. Whisk the egg whites to foamy and add 1 Tbsp of caster sugar into it, whisk till stiff peak. 6. Fold in 1/3 of the egg white into the flour mixture in step # 4 with spatula. Repeat until all the egg whites are folded in. The mixture will seem cuddled is normal. 7.Pour the batter into the prepared pan and bake for 50-60min ( my oven is 50min) or until the surface is golden. 8. 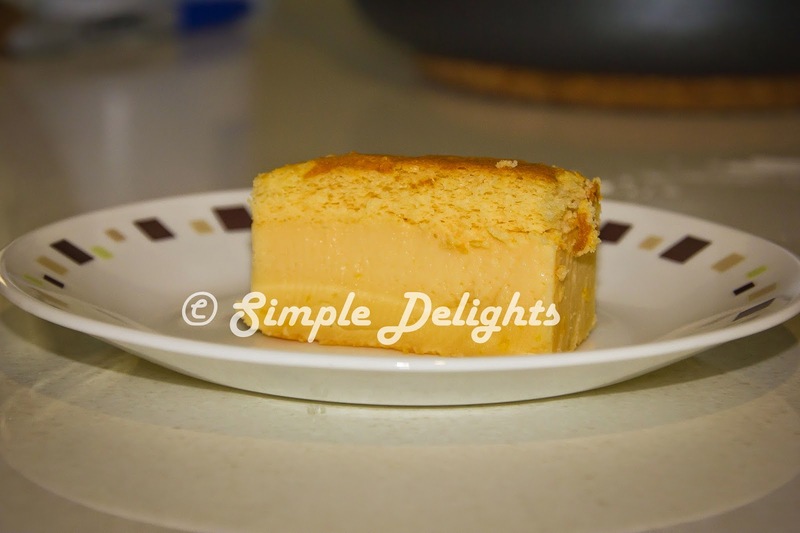 Once bake , take the cake out from pan let it cool and chilled in fridge before serve. I bake this cake twice. The first time I bake it was for our church life group gathering. The response was so good, I only manage to get one piece to try out. So the week after that, I bake another one for me and my beloved. Ok we did indulge ourselve with sweet now and then. At time it can be tire in adjusting our new role as parent. We need to pamper ourselve. I did not manage to take a good picture of the cake. The layer does not seem to obvious in the picture. I love the texture of the cake , it has the soft cake in 1st layer, soft custard cream on 2nd layer and the chewy part at the bottom. I enjoy soft cake and my beloved love any creamy cake. So this cake suit both of our taste. Give it a try if you want something different in one cake.